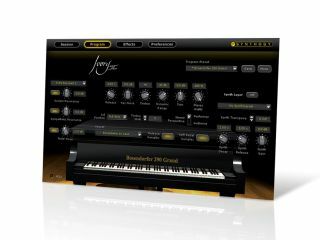 Synthogy is the developer behind a number of excellent grand piano ROMplers. We spoke to Joe Ierardi, one of the company's founders, to find out about the process behind their creation. Let's start with a bit about the history of Synthogy. "George Taylor and I were both engineers at Kurzweil Music Systems. In 2002, when we no longer worked for the company, we discussed the possibility of starting a company to design software instruments using the design principles we had used for years in making hardware instruments. "We basically agreed to form a company and largely designed our first product (Ivory) in that first 45-minute conversation." Can you briefly describe the process of sampling a piano? Does a real person have to press the keys over and over? "You could use a mechanical device, but in our case, a real person plays each note - quite often, that person has been me. If there's one thing that might surprise people, it's that they might think the process of sampling a piano is very interesting, but then an hour or two into the recording they run screaming from the studio! It's an incredibly long, tedious and painstaking process." Have you looked into physical modelling? Is your Harmonic Resonance Modelling technology related to it? "We haven't delved at all into physical modelling, though I think it's a fascinating and impressive technology. As for it replacing sampled pianos, I think that's something that was predicted and proclaimed to have happened already, and yet here we are still. "Will it eventually? Who can say? I think sampling will always have some tremendous advantages. First, it's an incredibly detailed and accurate rendition of the actual physical object. You know the sound of a Steinway when you hear it because you've heard it in so many musical recordings. These real instruments are unique, and they have a certain 'sonic signature' that we know and love. Sampling captures that signature quite effectively. "Secondly, sampling is based on digital recording, and digital recording is a proven winner. Plus, as an engineer, I maintain that you can always make a better recording. You learn something new in every recording you do, and you apply it to the next one. "Finally, sampling can be augmented by other technologies to achieve some of the desirable capabilities of physical modelling. I think we've demonstrated that with Harmonic Resonance Modelling - it's not physical modelling, but a form of modelling that effectively reproduces the real- time characteristics of sympathetic vibration." What's coming next from Synthogy? Have you considered branching out from pianos? "I can't reveal too much about our future product plans except to say that they are already underway. As I mentioned earlier, we do have experience creating all types of instruments and synthesisers, but the reality is that we're a small company and you simply can't do everything. We've got lots of ideas, though, so hopefully in time we'll be able to realise more of them."